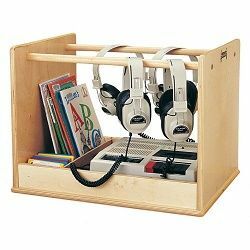 This portable listening center holds audio player, eight headphones, with partitions for books, CDs or cassette tapes. Birch and Maple construction. 15"W x 20"L x 15 1⁄2"H. Additional shipping charges apply.